I was ready to write off any chances of taking pictures of birds. 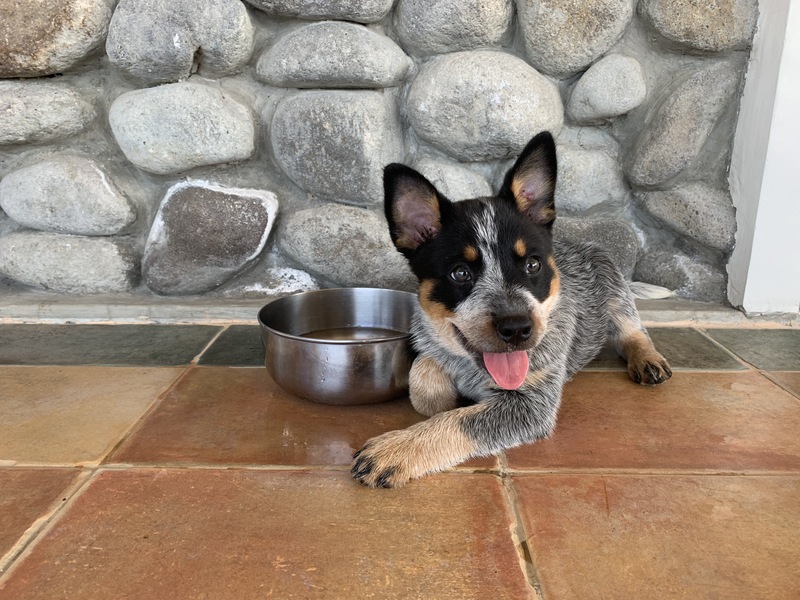 We were at the refuge with all our photography gear, but I thought that our chances of taking pictures of birds were slim since we were very preoccupied by Lulu, the new addition to our family! It turns out we had a fun bird photography session after all! We got our first photos and great views of White Eared Brown Dove in our place! I first saw this species in our place in December 2016 in the mango area. I didn’t have a camera at the time. I remember feeling very excited to see it since it’s a bird that is usually found in the forest. It’s a good sign for us to see more forest birds instead of the usual garden birds. There were two White Eared Brown Doves in the round pen. 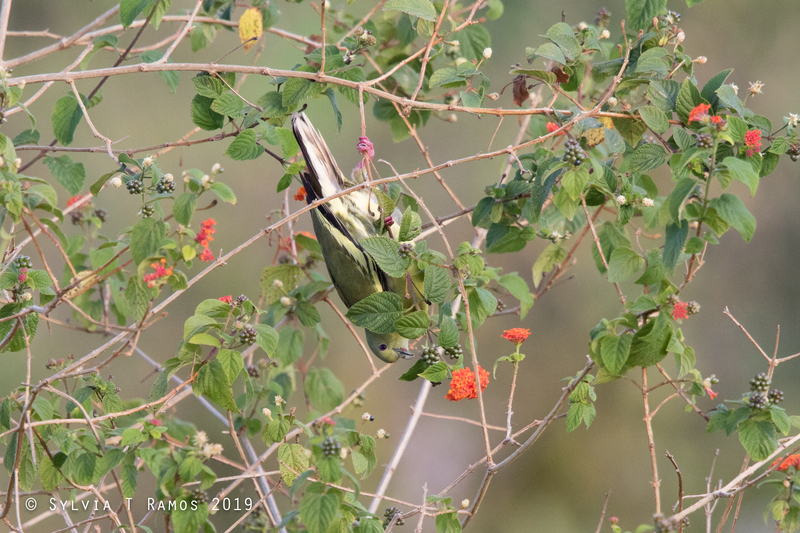 They were eating the fruits of the Lantana shrub. 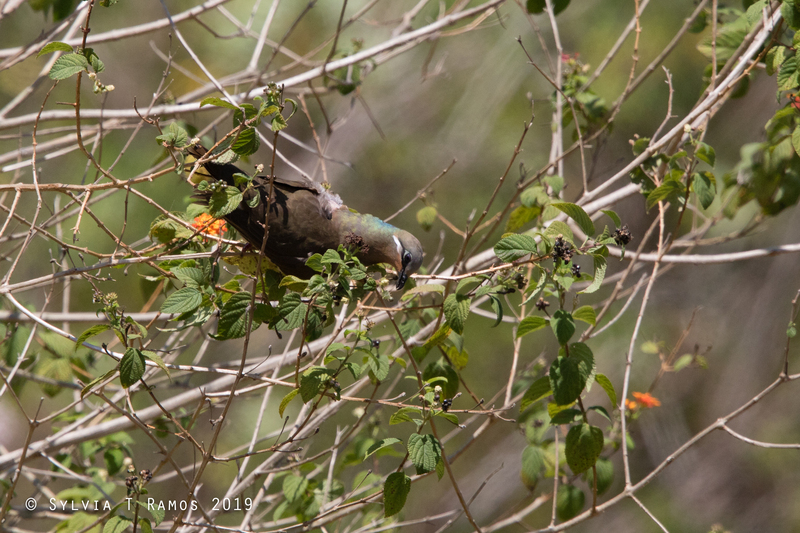 During the previous week, the Pink Necked Green Pigeons eating the Lantana fruits. I never realized before that Lantana was so popular with birds! I know the flowers attract butterflies, good to know that the birds like it too. In the US they spend a lot of money to remove from pastures it because it is invasive and is toxic to cattle. It is native to Central and South America. There was also a Spotted Dove that visited the round pen. It’s what first caught my eye and made me check the round pen. When we first saw it, the White Eared Brown was mostly hidden inside the tangles of the shrub. Later on it came out more in the open and then was joined by a second White Eared Brown Dove. The first bird stayed in the round pen for a long time. It has a visible bald patch on its back. looks like it is molting. What a treat to take take pictures without even leaving the veranda. We got to watch the new dog and the new birds at the same time! When we were newbie birders in 2008 one of our friends invited us to take pictures of waders and Philippine Ducks in his friend’s fishpond in Batangas. 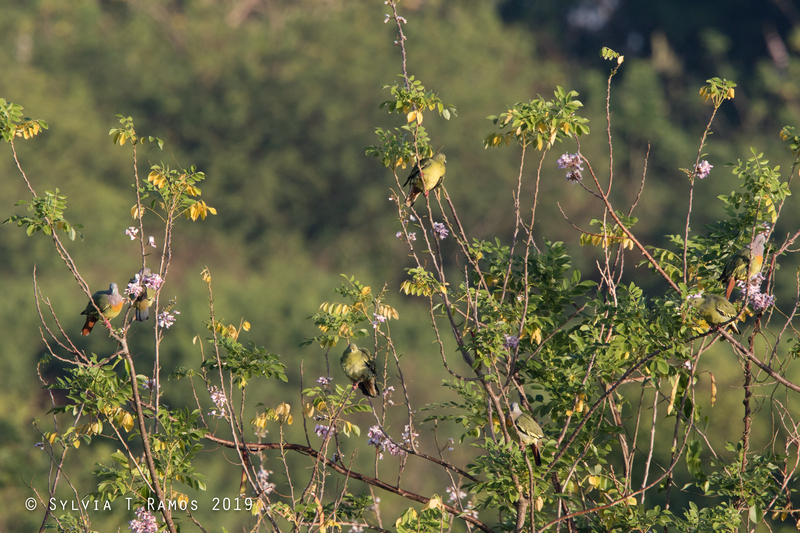 When we were done taking photos of the birds on the water, he asked us if we wanted to see Pink-Necked Green Pigeons. He said they were just nearby, perched on the trees. Of course we said yes. It was our first time to see them. They were so pretty! There were so many of them. The males had orange breasts! I was more excited over seeing them than the dull brown and grey plovers and plain white egrets that we drove there to see in the first place. 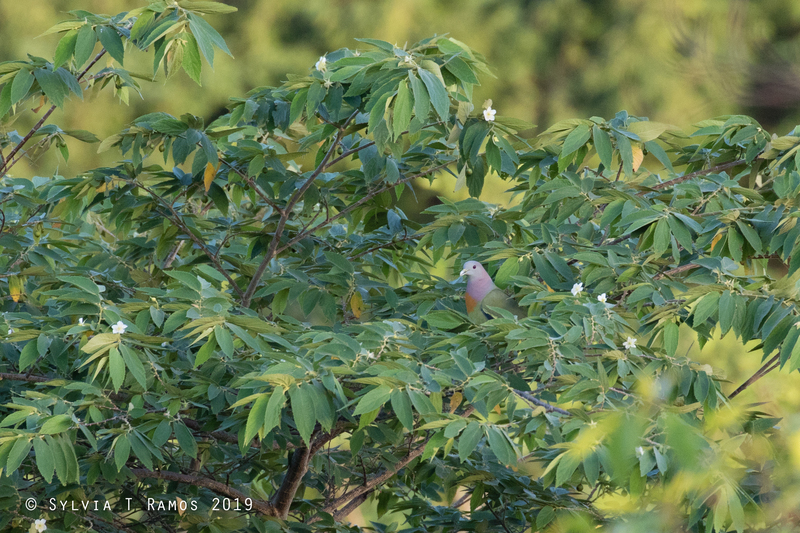 Now that we have this place, I get to see Pink-necked Pigeons every morning outside my own door! I am still excited about seeing them, maybe even more excited than when I first saw them in 2008. There are big aratiles trees behind the round pen that fruit year round. 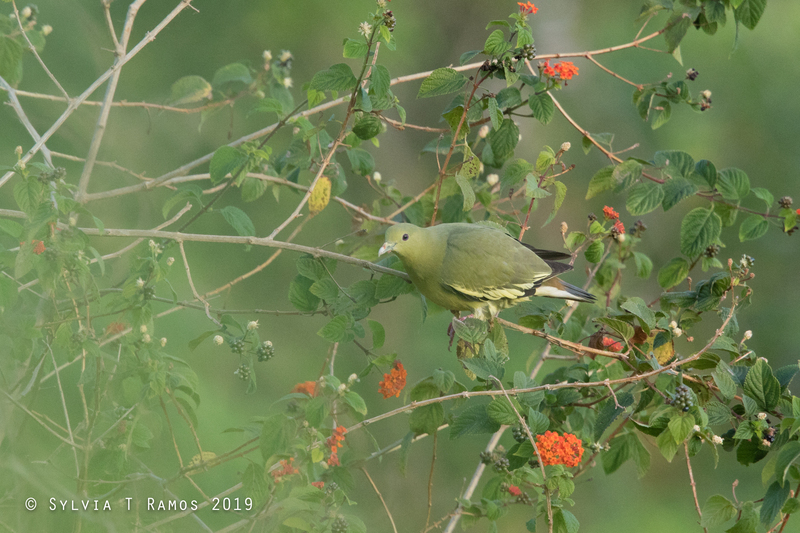 The Pink-necked Green Pigeons love the fruit. They make the aratiles their first stop in the morning. They even eat the green, unripe fruit! Then they they check out the lantana shrub that’s growing wild beside the round pen. We didn’t plant this shrub. It’s an invasive weed that’s also cultivated as an ornamental plant in urban areas. It used to be very popular as a garden plant in urban areas. In the US, cattle ranchers spend a lot of money removing this invasive weed because it is toxic to livestock. Birds and butterflies love it! Next is group huddle at the madre de cacao trees further behind the round pen. Breakfast is done and they spend some time grooming, preening, and probably just enjoying the sun and breeze. The madre de cacao look their best at this time of the year. They are full of pink flowers and new yellow leaves. The birds with their green bodies and pinkish-orange breasts make the trees look even better! Then the birds move on to other parts of our refuge.